In this interview, Alice and Sheryl Cooper sit down with Jocelyn and Aaron Freeman (Meet the Freemans). It is nearly 26 minutes in entirety. This post is going to try and condense it down with some highlight areas. But honestly, it is completely worth viewing the entire video. I found myself taking notes segment after segment – learning more and more about who these two are. I think there’s a very thoughtful line at about the 23:50 mark in the video. Aaron asks Sheryl and Alice what being a ‘power couple’ looks like. Sheryl immediately chimes in saying, “well first and foremost, let’s understand where that power comes from…we’re not the power couple, but we rely on a power much greater than ourselves, Our Creator.” That’s just the tip of the iceberg with this interview and this couple – buckle up, this is a fun ride. Amazing and profound on many levels, this video illustrates what marriages and relationships endure but also where our faith and strength should rely. There are five words and one phrase that we’re going to focus on in this post. In no particular order, we will discuss Storms, Addiction, Dysfunction, Identity, Reconciliation, and the Light of Christ. Through a combination of scripture and examples we will be walking through life, love, trials, hurdles, etc. in this post. Let’s find out what makes Alice and his bride (of over 40 years) tick. Storms. Right off the bat, the couple is asked about strength. Alice chimes in about life on the road. In a nutshell, he says home is where your heart is, but also claims that being on the road is the perfect storm. Force yourself, to step into this couple’s shoes for a second. Constantly travelling. Away from their children and grandchildren. Weathering storms of all sorts. It seems our lives are always in one of three phases….before, in the midst, or after a storm. There’s always something that we are about to deal with, are dealing with, or just dealt with. The key to life is finding a way to remain in peace no matter what phase you find yourself currently in. Psalms 34 focuses on blessing and praising the Lord at ALL times. Trusting in Him to deliver you through life’s journey. Dysfunction. The couple is asked about partnership and what that means. Alice refers to Sheryl’s thoughts saying, “marriage is two dysfunctional people, who refuse to give up on one another”. This seems to be true for most marriages. After searching for the term ‘dysfunctional’, it seems there are tons of self-help articles about what a functional vs. dysfunctional family looks like. It was comical to see how many different ways folks believe families can be ‘fixed’. Bottom line is this…we are all dysfunctional and in need of a Savior. Two people not giving up on each other with Christ at the center of their relationship can weather any of life’s storms. In Philippians 3:13-14, we find Paul focusing on the present (in Christ) instead of his past. Paul had seen and done many things at this point – some horrific, some incredible. Paul was as dysfunctional as the rest of us. He alludes to the thorn in his flesh in 2 Corinthians 12:7-9. Most likely his constant battle dealing with the things he had done prior to meeting Christ. The thorns in our lives can hinder us and deem us dysfunctional. But choosing to press forward, focusing on our present (in Christ) is what leads us to a functional, stable walk with Him and others we meet along the road. Reconciliation. According to their stories, both Alice and Sheryl never gave up on their marriage. However, there was a time when they had to separate in order for God to work in them individually. This is referenced in Acts 3:19, “Repent, then, and turn to God, so that your sins may be wiped out, that times of refreshing may come from the Lord.” However, after that time with God leads to healing…reconciliation with the persons wronged by your actions should also be reconciled. As it states in Ephesians 4:32, “Be kind and compassionate to one another, forgiving each other, just as in Christ God forgave you.” This is probably the most difficult task we face in life – asking for forgiveness and forgiving those that have wronged us. Light of Christ. Being asked how do you talk and counsel other couples, Sheryl brings up the point that you earn the right to be heard. By your lifestyle. By your love for others. By your treatment of others. In the relationships you form, you earn the right to spread seeds and share the Gospel. Alice goes on to point out that hopefully the Light of Christ is radiating off of us unto them. John 1:5 reads, “The light shines in the darkness, and the darkness has not overcome it.” Let that sink in for a moment. It only takes the strike of a match to light up a room. While we aim to show others the bonfire of His love burning within us, it really only takes a flicker of His Light (or His Love) to show someone else just how welcomed they are by Him. Wrapping up this week with Alice, stop and think about something. Fear, doubt, and lies have no grip or bearing over us. Christ has set us FREE. 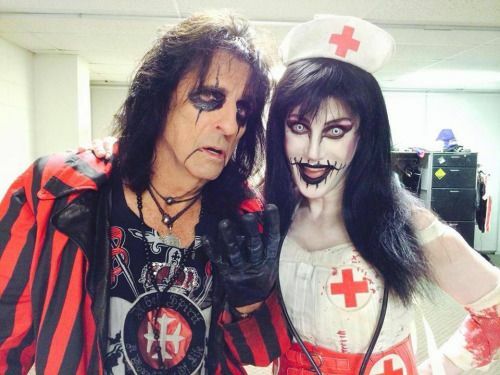 I have to admit that when God called me to write this blog I was cautious, fearful, and a bit curious as to what I would find as I peeled back the layers of Alice Cooper – really doing some in-depth research into who this shock rocker is and what he proclaims. I knew he’d claimed Christ and was a fellow believer. What I did not know was just how willing he is to share what it is that he and his family believe and hold dear. This video was the beginning of a better understanding of what and why God plans on continuing to use Alice Cooper to further the message of Christ. Through this blog and mission, I’ve learned to stop looking at the artwork on the cover and instead allow the pages to depict what the story is actually about. God Bless Alice and Sheryl Cooper! © 2018 Ocean Floor Web & Graphic Design Ministries, Inc.